Accepted for publication 18 June 2001. Published 6 July 2001. Zidack, N. K., and Jacobsen, B. J. 2001. First report and virulence evaluation of Erwinia carotovora subsp. betavasculorum on sugarbeet in Montana. Online. Plant Health Progress doi:10.1094/PHP-2001-0706-02-RS. Bacterial vascular necrosis of sugarbeet caused by Erwinia carotovora subsp. betavasculorum (Ecb) was identified in the Bighorn Valley near Hardin, Montana in 1998 and was observed at low incidence in the Yellowstone River Valley in 1999 and 2000. Until now, this disease had not been reported in Montana. Experiments were performed comparing the Montana isolate with isolates of Ecb from California for virulence against the California standards for sugarbeet resistance to Ecb. In our experiments, the Montana isolate was more virulent than all of the other isolates when plants were inoculated by injecting Ecb into the petiole. Variety USH11 was the most resistant and the most susceptible variety was Beta 4430, which has been shown to be resistant to CA isolates in other tests. In temperature experiments, sugarbeets became severely diseased at temperatures ranging from 20 to 28ºC, but severe beet (root) necrosis only developed at 24 and 28ºC. Montana farmers and growers in northern sugarbeet-growing areas should be aware of the potential for this disease during warm summers. Also, it is clear from these results that the Montana isolate should be used to screen varieties for resistance for Montana growers and that the California isolates are not suitable for this purpose. Disease management may be accomplished with resistant varieties, avoiding injuries to plants, minimal rates of nitrogen fertilizer, early planting, and plant spacings of 15 to 20 cm between plants (2). Bacterial vascular necrosis of sugarbeet was first reported in California in 1972 (2) and has also been reported in Arizona, Idaho, Texas and Washington. This disease caused by Erwinia carotovora subsp. betavasculorum (Ecb) had never been reported in Montana. In 1998, during a particularly warm summer, bacterial vascular necrosis caused losses of 5 to 70% in individual fields in the Bighorn Valley production area near Hardin, Montana (Barry Jacobsen, personal observation). Damage was most severe where hail injury occurred. Ecb was isolated from infected beets and its identity was confirmed using nutritional assays (1). 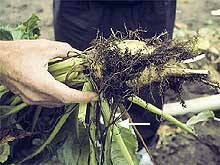 Bacterial vascular necrosis of sugarbeet causes both wilt and root rot symptoms in sugarbeet. Leaf symptoms (when present) include black streaking of the petioles and froth in the centers of the crowns, which is produced by escaping gasses produced by bacterial fermentation. Root symptoms vary from soft rot to dry rot (4). The disease is most severe at warm temperatures (24ºC and above) (3). Disease symptoms on sugarbeets in the Bighorn Valley and on plants artificially inoculated with the Montana isolate were consistent with those described in the literature (Fig. 1). Fig. 1. 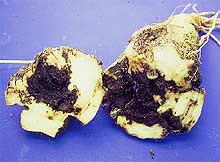 Symptoms of sugarbeet bacterial vascular necrosis: (A) a field-grown sugarbeet showing black rotted petioles and normal-appearing root exterior; (B) cross section of a severely diseased sugarbeet; (C) blackened petioles of a young sugarbeet plant inoculated with E. caratovora subsp. betavasculorum; (D) sugarbeet plant exhibiting severely blackened petioles and bacterial fermentation froth in the crown area (click each image for a larger view). Because this is a new disease to Montana, the purpose of this study was to determine similarity between the Montana isolate and California isolates, and to determine if the host/pathogen interaction is similar when inoculated onto standard susceptible and resistant cultivars. Also, since this is mainly a pathogen in warmer production regions, we wanted to test the Montana isolate for ability to cause disease at lower temperatures as well as the warmer temperatures that have been documented to promote severe disease in southern sugarbeet growing areas. Five different sugarbeet cultivars (Table 1) were obtained from Betaseed, Kimberly, ID. Seeds were germinated in Sunshine Mix (Sun Gro Horticulture Inc., Bellevue, WA) and after emergence, transplanted into a soil-mix consisting of equal parts of Bozeman silt loam soil, washed concrete sand, and Canadian sphagnum peat moss, and grown for 4 weeks in 10 cm square pots. Glasshouse temperature was maintained at 22°C day/20° night. The photoperiod was a minimum of 12 hours with M1000C/U lamps (Osram Sylvania, Danvers, MA) used for supplemental lighting for two hours in early morning and two hours in late afternoon during the winter. E. carotovora subsp. betavasculorum isolates (Table 2) were cultured on 50% tryptic soy agar for 2 days. Bacteria were harvested by flooding the plates with sterile phosphate buffer (0.1M, pH 7.0). Bacterial suspensions were then adjusted to OD (optical density) 1.0600nm and diluted 10x to yield ~1 x 107 colony-forming units/ml (cfu/ml). Table 1. Sugarbeet varieties with known resistance or susceptibility to California isolates of Erwinia carotovora subsp. betavasculorum (Ecb) obtained from Beta Seed, Kimberly, ID. Table 2. Erwinia carotovora subsp. betavasculorum isolates used to inoculate five different varieties of sugarbeet. 1State of origin of Erwinia isolate. 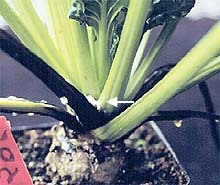 For the Ecb isolate and sugarbeet variety tests, two inoculation methods were used: 1) bacterial suspensions were injected into petioles of the first two true leaves with a 26-gauge hypodermic needle; and 2) 1 cm of leaf tips were sliced from the first two true leaves with a scalpel that had been dipped into bacterial suspensions. Plants were then transferred to a 28ºC growth chamber and rated for disease development at 2 and 3 weeks post-inoculation using a 0 to 5 scale (0 = no disease, 1 = small black lesion, 2= wilted petiole, 3 = systemic movement of pathogen evident as black streaking in non-inoculated parts of plant, 4 = whole plant wilting, 5 = dead). Four different growth chambers were used for the temperature study and were set at 16, 20, 24 and 28°C respectively. All had a light period 14 hours at 850 foot candles (+/- 25). Two month-old plants were inoculated by injecting 1 x 107 cells into 5 petioles approximately 2 cm from the crown. Plants were evaluated 2 weeks later by measuring the length of the black lesion which arose from the point of inoculation. Two months after treatment, sugarbeet roots were removed from pots, sliced in half lengthwise, and rated for percent necrosis of beet tissue. Statistical analysis was performed using the General Linear Models procedure of SAS (SAS Institute, Cary, NC). Least significant differences (LSD’s) were calculated for the isolate/cultivar test and orthogonal contrasts were performed for the temperature test. All experiments were performed twice. 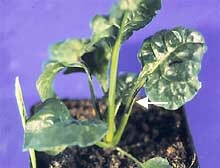 Two weeks after inoculation, sugarbeets inoculated using the petiole injection method showed more disease symptoms than plants treated using the leaf slice inoculation method. All sugarbeet varieties inoculated using the leaf slice inoculation method showed similar levels of disease (Table 3). The petiole injection method yielded significant differences between cultivars over all isolates tested. Beta 4430, a rhizomania-resistant cultivar (Steve Kober, personal communication), was the most susceptible. Variety USH11, the California standard for resistance (Steve Kober, personal communication), was the most resistant, while the standard susceptible variety HH50 was intermediate for disease in this group of cultivars. Table 3. Disease index of 5 varieties of sugarbeets inoculated with Erwinia carotovora subsp. betavasculorum (Ecb) averaged over 5 isolates of Ecb (2 weeks after inoculation). 1Within each column, means followed by the same letter are not significantly different (P < 0.05). The five Ecb isolates showed significant differences in virulence with both inoculation methods, and the two methods yielded different rankings for virulence of the isolates (Table 4). For the leaf slice inoculation method, isolates HS SP2, B3, and EC261 had similar levels of disease and were higher than MT1 and HS SP5H. The petiole injection method resulted in the higher disease for the Montana isolate (MT1), with the four other isolates similar when data was averaged across all sugarbeet varieties. Statistical analysis revealed a highly significant (P < 0.0001) interaction among sugarbeet variety and isolate of Ecb (Table 5). The Montana isolate produced statistically higher levels of disease for all varieties except Beta 4430R. Table 4. Disease index of sugarbeet averaged over 5 varieties inoculated with 5 different isolates of Erwinia carotovora subsp. betavasculorum using two different inoculation methods (2 weeks after inoculation). Table 5. Disease index of 5 varieties of sugarbeet inoculated with 5 different isolates of Erwinia carotovora subsp. betavasculorum using the petiole injection method (2 weeks after inoculation). 2Within each row, means followed by the same letter are not significantly different (P < 0.05). Two weeks after sugarbeets were inoculated with Ecb isolate MT1 using the petiole injection method, the formation of black lesions up and down the petiole had progressed rapidly for sugarbeets at 20, 24, and 28ºC while plants held at 16ºC showed only small lesions. Orthogonal contrasts indicated that plants at this temperature were significantly less diseased than plants at all other temperatures (P < 0.0001) (Table 6). Two months after inoculation, 60% of the plants grown at 28ºC had died while only 10% had died at 24ºC and none had died at 16 and 20ºC. Roots from plants grown at 28ºC were almost completely rotted and beets at 24ºC also had significant damage. While plants held at 20ºC had extensive lesion development, damage to root tissue was minor and not significantly different than for sugarbeets grown at 16ºC. Beets grown at 16 and 20ºC were significantly less damaged than beets at 24 and 28ºC (P < 0.0001). These results for the Montana isolate are consistent with published reports of temperature requirements for disease development by California isolates (3). In experiments not reported here, plants which showed very little disease at 16ºC for over two weeks developed severe symptoms one to two days after being transferred to 28ºC, and the majority were fully wilted after approximately one week. Table 6. Effect of post-inoculation temperature on the development of lesion length (from site of inoculation), percent taproot necrosis, and survival of plants inoculated with Ecb isolate MT. 1Black lesions were measured 2 weeks after inoculation. 2Beet necrosis was measured as % necrosis of total beet root tissue 2 months after inoculation. These experiments show that the Montana isolate of Ecb is significantly more virulent than the isolates from California against a limited set of sugarbeet cultivars. Distribution in Montana seems to be limited to the Bighorn and Yellowstone River valleys. In experiments not reported here, 40% of sugarbeet varieties approved for the Billings factory production area of Montana in 1999 and 2000 had high levels of resistance. Reduced disease incidence in 1999 and 2000 is partially due to growers in the affected area selecting resistant varieties or avoiding highly susceptible varieties identified in our petiole inoculation screening tests. We are continuing to screen approved varieties and supply this information to growers and seed companies. While this disease may not be a problem under normal growing conditions in Montana, farmers should be aware of the potential for the development of the disease during very warm summers or during warm periods following hail storms. Montana growers should plant resistant varieties and may also reduce disease potential by using minimal rates of nitrogen fertilizer and maintaining in-row plant spacing of no more than 15-20 cm (2). Disease severity has been reported to be higher under center pivot irrigation as compared to furrow irrigation (4). This was true in the 1998 epiphytotic in the Bighorn river valley. We would like to express our appreciation to Steve Kober (Betaseeds, Inc.) for supplying sugarbeet seed and Dan Opgenorth (California Department of Food and Agriculture) and David Kuykendal (USDA/ARS) for providing isolates of Erwinia. This research was funded by the Western Sugar Joint Grower Research Board and the Montana State University Agricultural Experiment Station (MAES Project 913223). This manuscript has been assigned Journal Series number 2001-13, Montana Agricultural Experiment Station, Montana State University-Bozeman. 1. Thomson, S. V., Hildebrand, D. C., and Schroth, M. N. 1981. Identification and nutritional differentiation of the Erwinia sugar beet pathogen from members of Erwinia carotovora and Erwinia chrysanthemi. Phytopathology 71(10):1037-1042. 2. Thomson, S. V., Hills, F. J., Whitney, E. D., and Schroth, M. N. 1980. Sugar and root yield of sugar beets as affected by bacterial vascular necrosis and rot, nitrogen fertilization, and plant spacing. Phytopathology 70: 605-608. 3. Thomson, S. V., Schroth, M. N., Hills, F. J., Whitney, E. D., and Hildebrand, D. C. 1977. Bacterial vascular necrosis and rot of sugarbeet: General description and etiology. Phytopathology 67:1183-1189. 4. Whitney, E. D. 1986. Diseases caused by bacteria and bacterialike organisms. Pages 23-26 in: Compendium of Beet Diseases. E. D. Whitney and James E. Duffus, eds. American Phytopathological Society, St. Paul, MN.